"Family favorite. They don't last long. Taste great from the oven. I like to freeze leftovers the same day. Great for breakfast or lunch pails. 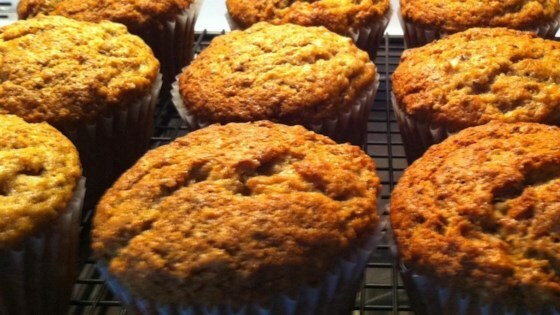 Freeze ripe bananas until you're ready to do some baking." Mash bananas in a bowl. Add brown sugar, butter, white sugar, and eggs; mix well. Add all-purpose flour, whole wheat flour, flax seeds, baking soda, and baking powder. Scoop batter into the prepared tins. Bake in the preheated oven until tops spring back when lightly pressed, about 20 minutes. Not too sweet and not too bland. Texture is great too! Will make again!